This province is one of the most popular areas for visiting tourists, largely because of its varied topography and natural beauty. The north of the province is marked by rolling hills and the beach resort of Varadero, the south is home to a large area of swamp land and the beach of Giron, better known as the Bay of Pigs. Central Matanzas is a long stretch of rolling plains whose red and fertile soils produce the highest yield of sugar crop in the country. Other crops such a tobacco, citrus fruits and vegetables are also produced in abundance. Matanzas often called "the Athens of Cuba" and famous for its many bridges, interesting architecture and music is on the way to famous Varadero Beach. Birthplace of the Danzón, Matanzas is also a good place in which to hear a danzonete or rumba. A city on the sea, it has drawn on the rhythm of the waves, the vigor of its morning breeze and the stately calm of its rivers in creating its culture. "The Hershey Train" is the only electric railway that has ever existed in Cuba, is operating since 1921 and travels from Casablanca Station in Havana to Matanzas. The trip is magical and a good way to get to and from Matanzas; and experience the natural beauty of Cuba and the Cubans. Performance art as part of the Matanzas City 2011 annual festival held in "Freedom Square" opposite the Hotel Velasco. Cuba hosts an annual season of Street Theatre, many performing companies from around the world enjoy the oportunity of working for the cubans in their own streets. Playa Giron, on the eastern side of the famous Bay of Pigs (Bahia de Cochinos), 48km south of Boca de Guama, is named for a French pirate who frequented the area centuries ago. The CIA-sponsored landing here on April 17, 1961, was defeated within 72 hours, as a museum and many monuments proclaim. In all, 200 invaders were killed, 1197 captured, and 11 hostile planes shot down. You really get the feel of reliving history by coming here, and the clear Caribbean waters washing these shores make Playa Giron a favorite destination for scuba divers and snorkelers. A lasting legacy of 1961 is that the entire Bay of Pigs area is strictly out of bounds to cruising yachts. Playa Giron's main resort is rather pleasant, and a huge seawall provides a protected swimming area. Long, white Playa Los Cocos, where the snorkeling is good, is just a five-minute walk south along the shore. The rocky soils of this region are of little use for agriculture and the population is sparse. Distances are long and public transportation is poor, so unless you've rented a car, you'd better be prepared to rough it. Located in the vicinity of the city of Matanzas, Yumuri is one of the most picturesque landscapes in Cuba. A river of the same name, which banks were once home to native indian populations, runs at the bottom of this 8km wide Yumuri valley. The Yumuri Valley is fringed by a 150 m-high mountain ridge, broken only to the west. The top of those elevations are excellent natural lookout points to admire the view across the Valley, including as a significant site, the Monserrat Hermitage built by Catalonian immigrants. Since colonial times, sugarcane and vegetable plantations alternate with magnificent royal palm (Roystonea regia) trees-the Cuban national tree- in the Yumuri Valley. This singularly attractive rural landscape is the backdrop to the Horizontes Casa del Valle Hotel, located just 3 km away from Matanzas and a one-hour-drive away from Varadero. It offers an ideal setting for the practice of outdoor activities, including trekking and hiking, horseback riding and cycling. Several paths and trails are available for ecotourism: La Tierra de los Caracoles trail leads to an ancient aboriginal site and a flower farm; El Abra trail on the Bacunayagua river takes visitors through areas rich in vegetation and ends up at the river mouth where you can bath in the sea. Both adults and children can go along these trails as they are not difficult to climb. The facility also offers programs against stress, obesity, hypertension and asthma, which feature ozone therapy, dieting, massage, acupuncture, thai chi and other therapies. Parque Nacional Ciénaga de Zapata covers 628,171 hectares. is the main wetland in Cuba, as well as the largest (and well-preserved) of the Caribbean Islands. The Zapata Peninsula biosphere is a huge natural reserve for all manner of wildlife including local and migratory birds, lizards, crocodiles and rock crabs. Zapata Biosphere Reserve shows a great diversity of ecosystems such as grasslands; mangrove, Ciénaga, semi-deciduous, evergreen coastal and sub-coastal forests; coastal and sub-coastal matorral and coral reefs with principal coral species and coastal lagoons. The area also supports the main populations of the Cuban crocodile (Cocodrilus rhombifer) and American crocodile (C. acutus) and birds as the great flamingo (Phoenicopterus ruber). Some 9,000 (2001) people, mostly of Spanish origin, live permanently in one of the largest biosphere reserves in Cuba. Economic activities are mainly silviculture, fisheries, community agriculture, tourism, handicraft and apiculture. At La Boca you can see crocodiles and take a boat to the picturesque Guama, a group of tiny islands connected by wooden bridges. The area is also home to one of the largest underground cave and lake systems in Latin America. Continuing 13km south from La Boca de Guama you reach the famous Bay of Pigs at Playa Larga. US-backed exiles tried to invade Cuba through this bay on April 17, 1961. The main museum dedicated to these events is at Playa Giron, which is 35km father south. The little village of Playa Larga makes a good base for visiting the adjacent nature reserves in Gran Parque Natural Montemar. 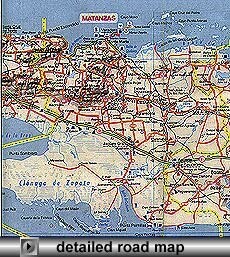 Fishermen can partake in bonefishing at Las Salinas, and for tarpon and snook there is Rio Hatiguanico.